Today I thought I’d share a few cute holiday gift ideas with you! And if you missed my Favorite Things giveaway that opened last night, click here to enter for a chance to win my favorite lip shades, my favorite lipstick holder and my favorite perfume of all time!!! Have a great Wednesday! Love your blog and i will love this lipsticks ? Thank you!!! Love these favorite items! Great post. Love the ribbed coat sleeves! Wish they weren’t sold out in camel, it’s beautiful though!! Great gift guide picks! Some of these are on my wish list. I admire you Rachel! You are my role model and the embodiment of a perfect woman for me!! You’re so gentle and feminine! I’ve been inspired by your Instagram posts for over three years now and can’t wait for you to start vlogging ?God bless you and your beautiful family! Love anything beauty related. Would love to win this! Love this gift guide! I know some of your pieces are on my wishlist! In love with your selection especially the wrap coat and lace ruffles top! The Sentaler Coat is a must have… Gorgeous! Hoping to win these! Love your blog and have been following you for years! I love all the blush pinks and the Rachel Parcell skirt!!! Would love to win these!!! This J.Crew coat has been on my wish list. Such a good piece! Loving all of these gift ideas! So colorful and fun! Thanks for sharing your faves!!! Fabulous list and Merry Christmas! I love everything you’ve included here, Rach! Those flannel heels are way too cute and perfect for the holiday season! Thanks for sharing and I hope you have a very Happy Wednesday! Also thank you for having a classy style! You are a great role model for women and girls throughout! Love that navy sequin skirt! I love this giveaway! Makeup really is a girls best friend and I could really use some extra beauty during finals week! Thank you for doing the giveaways! 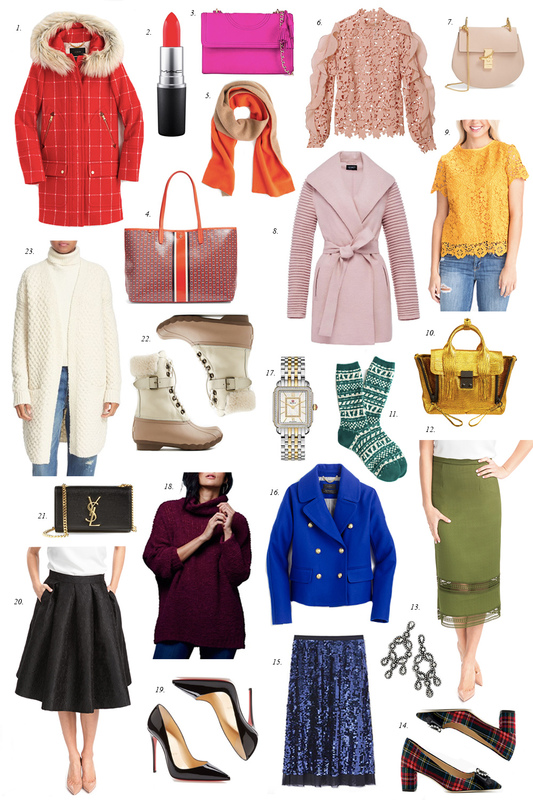 Love all of these gift ideas- especially the red coat and sparkly skirt! Such a treat to read your sweet blog every week. I’m in love with your family’s close relationship ! It is so refreshing to see your funny snap chats and adventures together. I hope you’re enjoying the Christmas season with your beautiful babies, husband, family & of course your sweet pups ! This gift guide is a dream ✨ I may have to send it to my hubs!!! ? Love all these gift guides. So in love with that jacket!!!! I love all of the lace details! OMG that pink Tory Burch has been on my wish list for sometime I love it! Love it all! Great choices in handbags. I hope I win I love lip products ? I would LOVE to win! Merry Christmas! Love, love, love that blush coat!! what fun picks! wahoo for the holidays! These all look like great products!!! #4 AND #6 BOTH LINK TO THE PINK RUFFLE LACE BLOUSE AND I NEED TO KNOW WHERE THAT HANDBAG IS FROM! IS IT A GOYARD? I love your style & clothing line!! That lip stick holder is so cute and to die for! Love and thanks for such a wonderful giveaway. Merry Christmas! That pink coat is so gorgeous! Love your style & your blog! Hope I win!! Such a lovely gift guide! Love those plaid heels! Love these items to add to my list to hand out to my family :) hoping you do a stocking stuffer idea post soon!! Love these picks especially the self portrait top! It’s beyond amazing! I love th clean colors of those Jcrew winter boots! Great favorites! The prettiest round up! Thanks for sharing. I might have to treat myself to a thing or two.